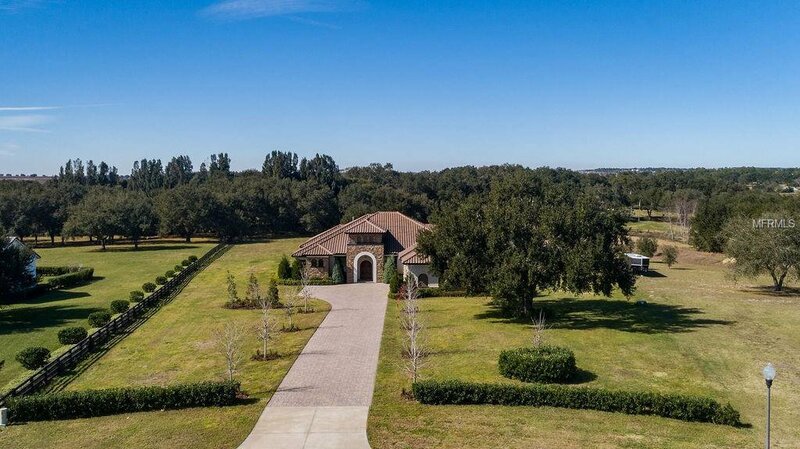 Stunning 3 plus acre estate in gated Savannah Ridge. Live the country lifestyle minutes from everything! This lovely, custom built home features views of Flat Lake and rolling pastures. The sprawling, one story plan has a 3-way split plus a study allowing room and privacy for all. The beautiful gourmet kitchen features stacked cabinetry with glass doors and custom crown molding, double convection ovens, built in microwave, 6 burner gas cooktop and a pot filler. There is gorgeous wood look tile throughout the house. This home is constructed to withstand the test of time with poured concrete exterior walls and a tile roof. The large gathering room has a screened lanai with a wood burning fireplace and stacking sliding doors for extra entertaining space. There is also an enormous covered lanai and pre plumbing and gas for a future pool and/or summer kitchen. The outdoor shower and pool bath are already in place. The 4 car tandem garage with a drive thru bay has ample space for all the toys and with this much land, you can build on more if needed! Make an appointment to see this one of a kind estate today and start living the good life in the country!! Listing courtesy of RE/MAX EXCLUSIVE COLLECTION. Selling Office: HOMEXPO REALTY INC.